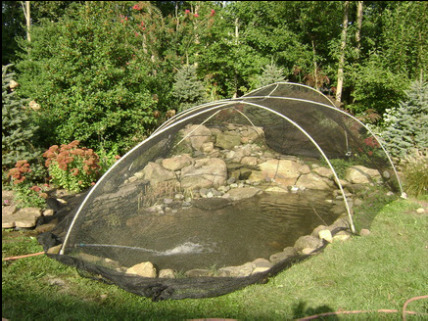 ​Pond netting is sometimes needed in the Doylestown area of Doylestown & The Bucks, & Montgomery County Areas Of Eastern Pennsylvania (PA) when excessive leaves have the potential of making their way into your pond. If your pond is in the direct vicinity of large trees then you will want to consider netting your pond. In the Northeast this needs to be done before the first frost or usually sometime in October. Fall netting is an easy process. A net is stretched across the pond and anchored with rocks and/or pins. It is best not to have the net resting on the water surface since it will be difficult to remove with all the debris on it. Once all the leaves have fallen then the net is removed for the winter.